Welcome To The FAQ Page ! Q: I have downloaded and unzipped / decompressed the Animated Background / Wallpaper, however the page displays but there is no animation just a rectangular out line box ? A: You need to install / update your Flash Player, please see the support page for quick and easy install. Q: I have download one of the Animated Backgrounds / Wallpapers and displays just fine, however it is not in the centre of the screen or it dose not fit my screen properly. Is their any thing I can do about this ? Once you have made the changes just save and exit. Now go back to your desktop and reselect Street Fighter II as your display. Tip when typing in new numbers try to keep the ratio. For example 950 x 800 the difference between the two is 150 so in the second example we typed 550 x 400 which kept the ratio of 150 between width and height. Q: How do I know what sizes to type in ? A: Right click on some empty space on you desktop from the pop-up menu chose the settings tab. 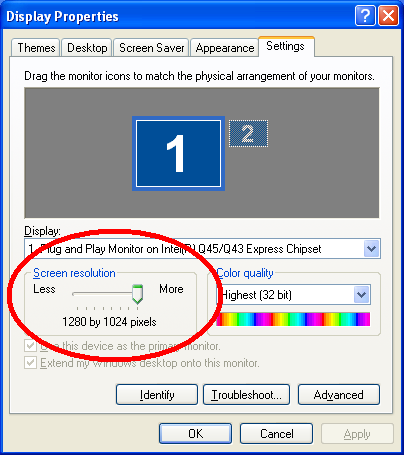 Look at the red circled area in the image below, the numbers 1280 x 1024 are you screen size. Start by typing numbers that are smaller than you screen size, but be sure to keep the ratio. Q: How do I move it to the left or right or up and down, in order to get it to the center of my screen or wherever I need it to be ? Now change it to -100 or some other number as appropriate, you will have to start with a little trial and error the fist couple of times you try this in order to get a fell of how the numbers relate to your particular screen size. You may need to activate “Active desktop background” in some versions of Microsoft Windows.